We are engaged in manufacturing and supplying an extensive assortment of Self Adhesive Material in the national market. 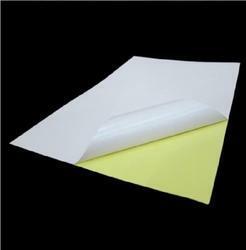 Variety of material available with us under this category includes Velum Self Adhesive Paper, Cast Coated Self Adhesive Paper, Wood Free Self Adhesive Paper, Transparent/Opaque OPP/PET/PVC/LDPE Self Adhesive Films And CS1(Chromo) Self Adhesive Paper. Generally, we use a water based acrylic pressure sensitive adhesive in our product range but due to the varied customer demands and uses, our organization also offer customized adhesives of different grades to suit these applications. These products are available along with the release liner that comprises SCK , CCK in 60/67 gsm, glassing base release liner and kraft liners in 40/55/60/130 gsm. The adhesives described above are majorly used in preparing varied labels to be used in different applications bar-code labels, point of purchase labels, mailing labels, product labels and marking labels. 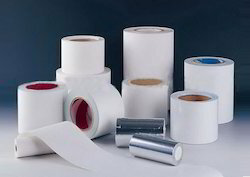 We manufacture our range of self adhesive material as per the application method, dispensing automatic/manual, printing properties required, surface area for adhesion, shape of the surface, temperatures for application, size of label, shape of the substrate on which to be applied and after application storage of the applied product. Along with these mentioned category of products, we comprise different other criteria of adhesive items in each category, which counts up to 125 more to offer. High Performance Self Adhesive material with best quality and customisable size. The material used for manufacturing self adhesive label stock in prime and imported. Looking for Self Adhesive Material ?